Rights committee is hold a job fair for persons who are unemployed or under employed on 10/24 from 5 to 8 p.m. C. Policy Issues Subcommittee - Robin read a report by the previous subcommittee. Among the recommendations was a review of the group's procedures, the need to clarify its purpose in relation to EOD and the ombudsperson, and an increase in oversight relating to campus trends relating human rights. VI. New Business A. Martin Luther King Week with be January 15-19. We need to determine whether we will be participating with a specific Committee event. B. Marcella noted that the UI Center for Human Rights reading group will begin on 10/18. She will forward more information to members. 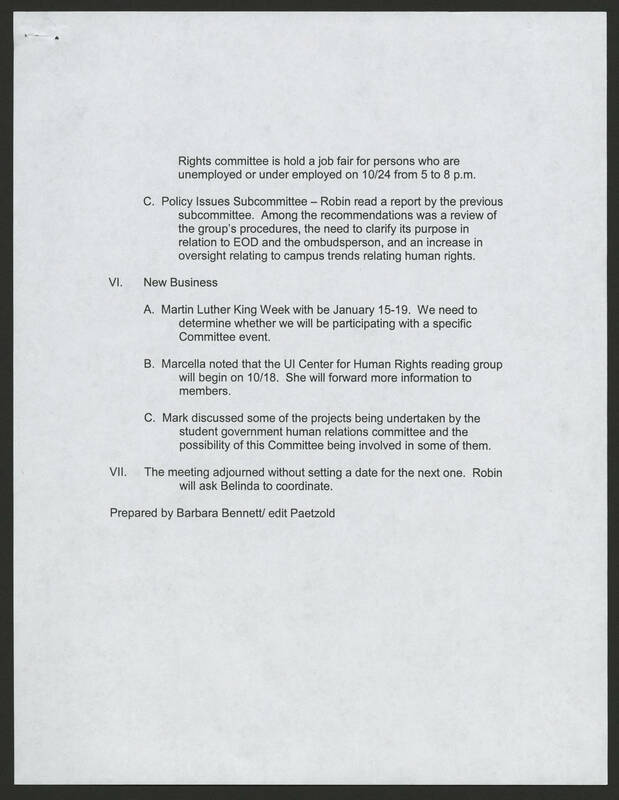 C. Mark discussed some of the projects being undertaken by the student government human relations committee and the possibility of this Committee being involved in some of them. VII. The meeting adjourned without setting a date for the next one. Robin will ask Belinda to coordinate. Prepared by Barbara Bennett/ edit Paetzold.